Many people believe that the events in the book of Revelation are chronological, meaning they happen one right after the other in the order they are presented in the book. To me it seems as if people have not thought this our very well. If we take the events of Revelation chronologically it paints a strange picture. The sixth seal says the sun turns black, the moon to blood and the stars fall like over ripe fruit and then finally the sky is rolled up like a scroll. Can you imagine having the order of the cosmos being undone and finally being rolled up and removed, no longer to be seen? 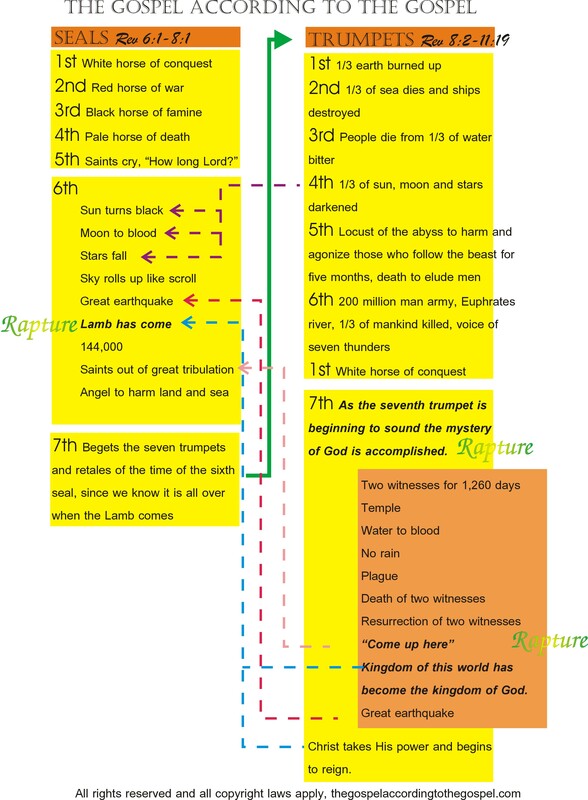 If all of this is done at the sixth seal, then can anyone tell me what in the heck is the fourth trumpet all about? I thought all the cosmos was removed at the 6th seal, yet we have them back again at the fourth trumpet? Did John forget to record the blowing of the 2nd kazoo that sounded the return of the sun moon and stars? If we want to assume that the stars have fallen and the cosmos is rolled up at the sixth seal, this means that the antichrists kingdom will not have the benefit of the sun, moon and stars. But if we say these are still there then what was the sixth seal all about? If Revelation is chronological, doesn’t Jesus jump the gun a little? At the sixth seal it says, “the great day of their wrath has come.” What in the world is Jesus doing having the great day of His wrath at the sixth seal, when the rest of us are still waiting for the beast to take His kingdom after the trumpets? Maybe we have it all wrong. Maybe the beast doesn’t face God’s great day of wrath after all. I also get a little confused about who is persecuting the Christians if I take Revelation chronologically. At the 6th seal we have the saints who have come out of the great tribulation. I have to assume that it includes the ones at the 5th seal asking the Lord how long. So if the saints have come out of the great tribulation, then who is the Beast persecuting in when he gets his kingdom between the trumpets and the bowls? His seams to have missed his own tribulation. When taking Revelation chronologically I also get the feeling that Jesus has short term memory loss and presents to us a déjà vue. You know that strange funny feeling this has happened before. We have a great earth quake and the Lord’s coming to do some great hind kicking at the sixth seal. Yet I see Jesus doing an encore after the mystery of God is complete at the seventh trumpet. There He has a great earthquake and He takes His power and begins to reign. Was He joking the first time? Was it practice? And what is the big idea of Jesus taking His power and beginning to reign at the seventh trumpet only to give kingship of the earth back to the beast just before the bowls? I always thought that when He began to reign He would put all of His enemies under His feet. Not let the beast out. In fact I always thought that when He comes and takes His authority and begins to reign He defeats the beast. But how can He do this if the beast chronologically comes after He begins to reign? Something doesn’t seem right in chronological land. How is it men can defend this kind of view, by having blinders on?